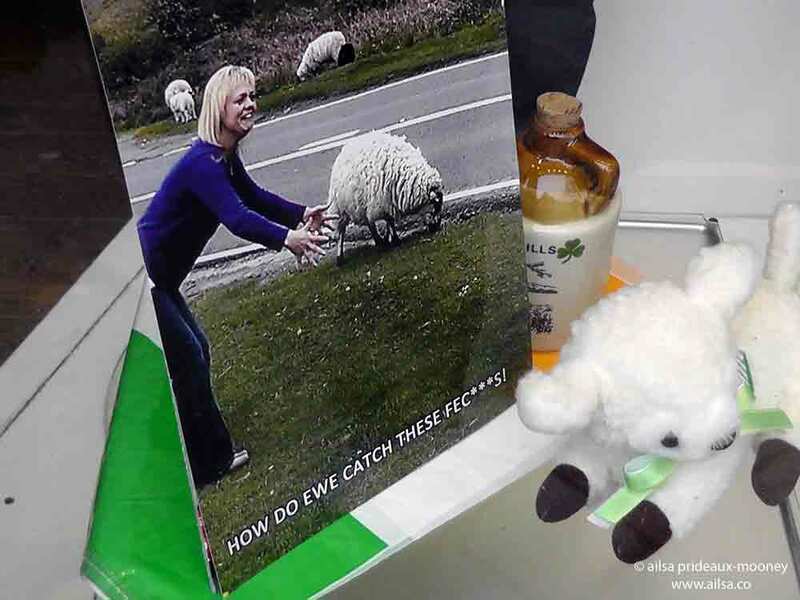 Sheep Olympics | Where's my backpack? 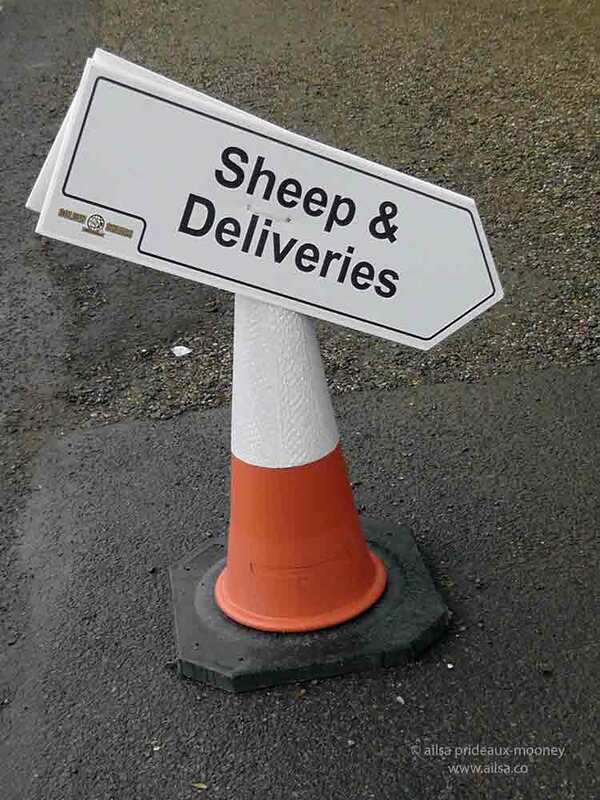 …so yesterday I popped over for a bleating fleeting visit. 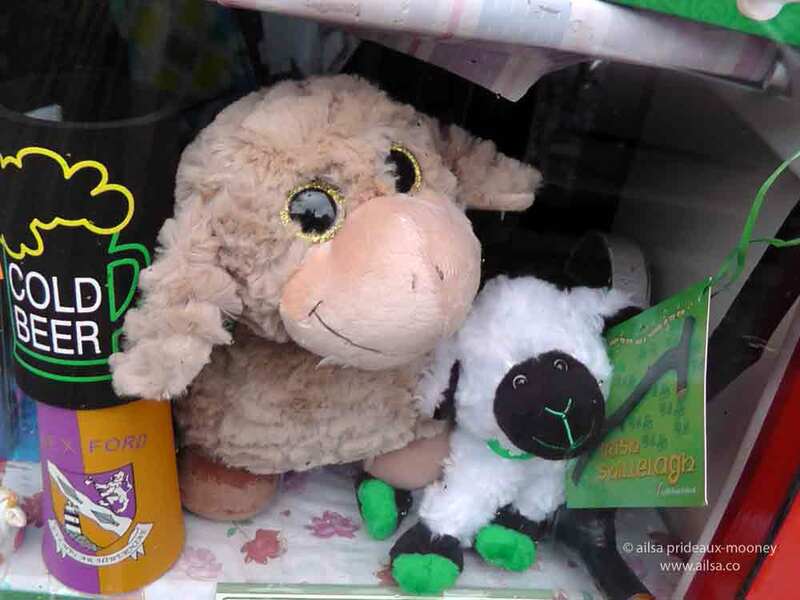 Before visiting the main event I took some time out for a little window-sheeping – all the shop fronts in town were decked out with sheep crammed into the most unexpected of places. 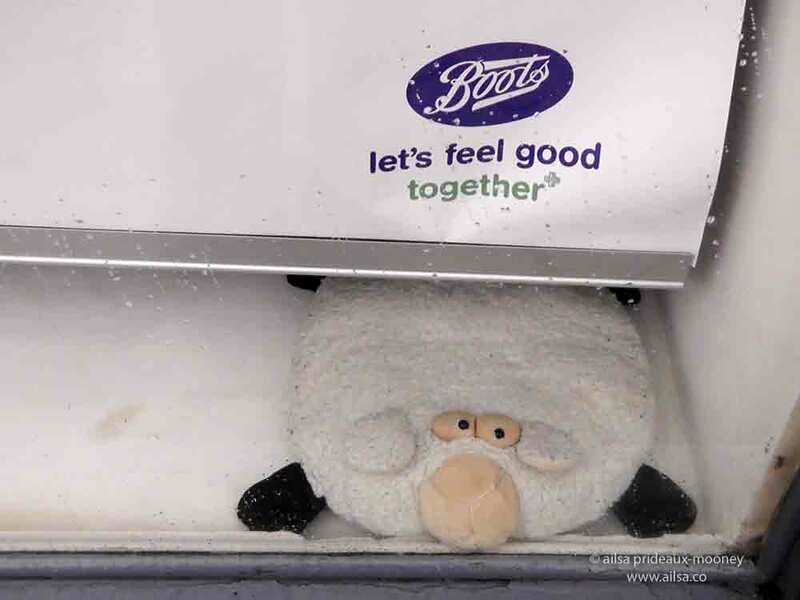 … and a disturbingly flattened sheep peeping out of the local Boots window. 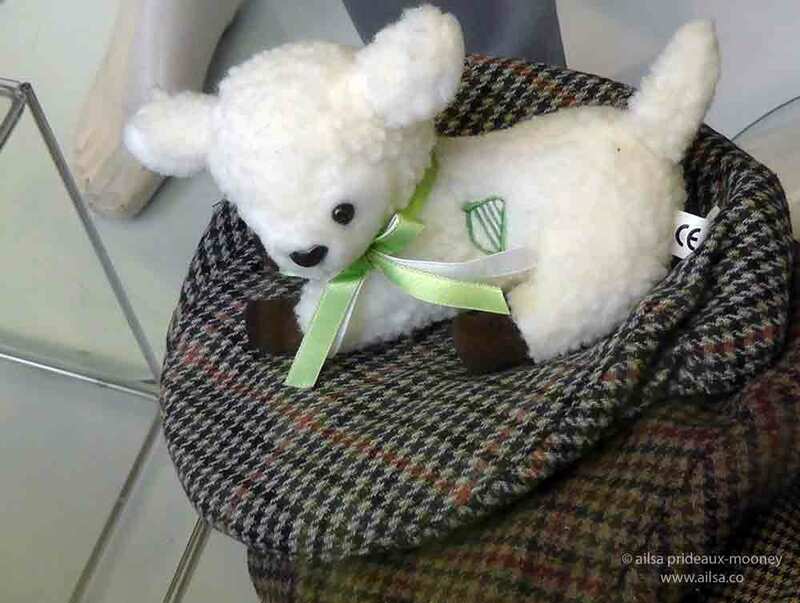 Seriously, is it just me or does that sheep look like roadkill? 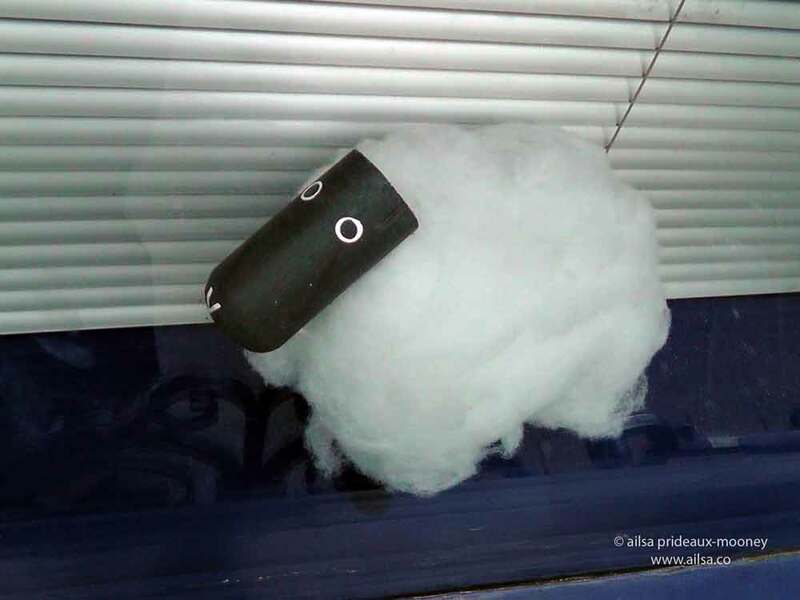 …and the scariest sheep appeared in the window of a local bank. 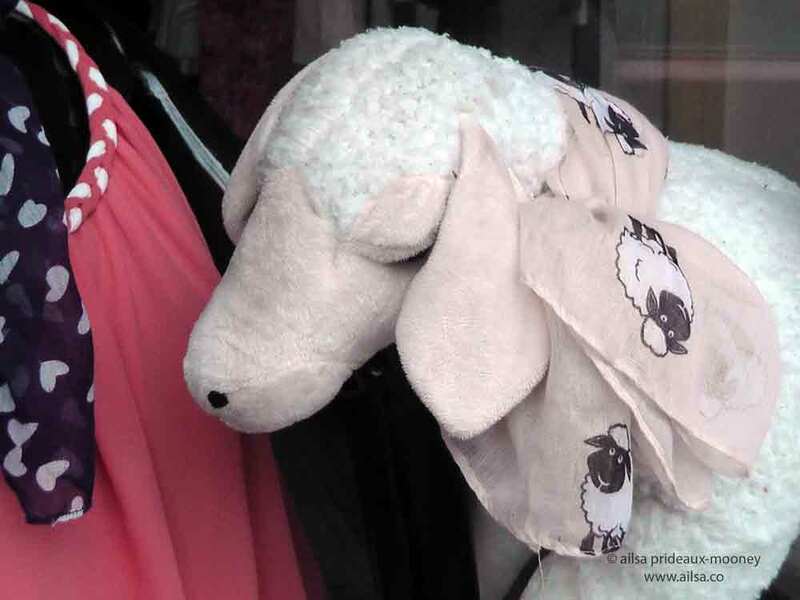 He looked like a V for Vendetta sheep wearing an expressionless mask and threatening revolution. Finished with my walkabout, I followed the signs towards the main event. 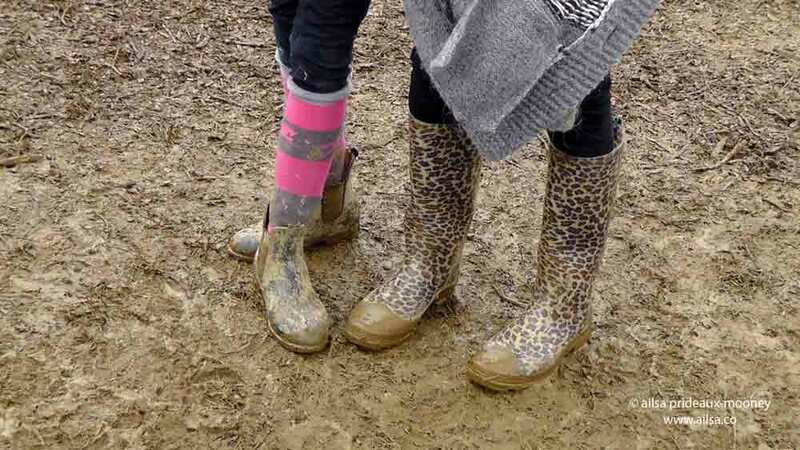 The venue was a huge muddy field just outside of town. 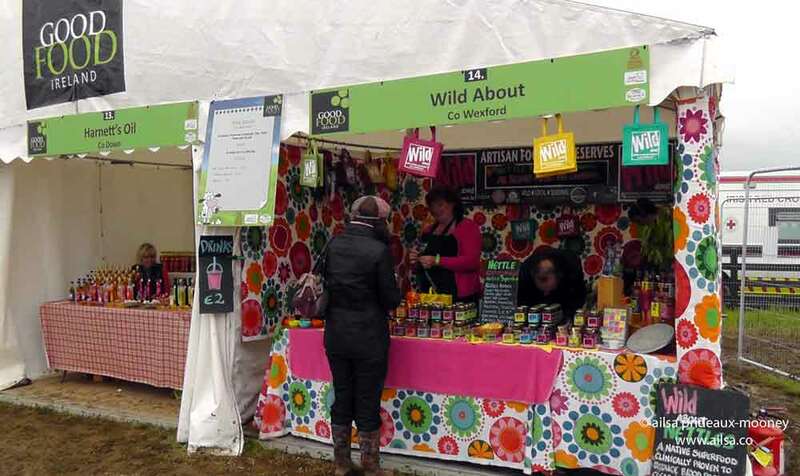 Miles of thick, sticky mud spread out between gaily decorated tents and stalls. 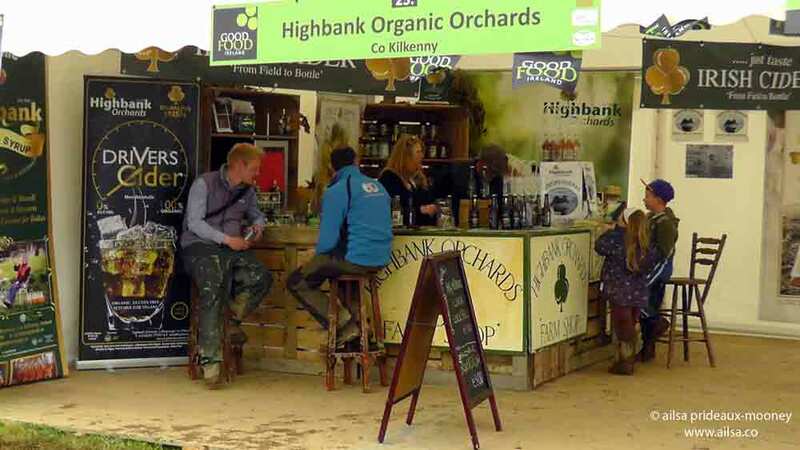 …and even a pop up bar or two for good measure. I realized rather early on that I should have worn boots. 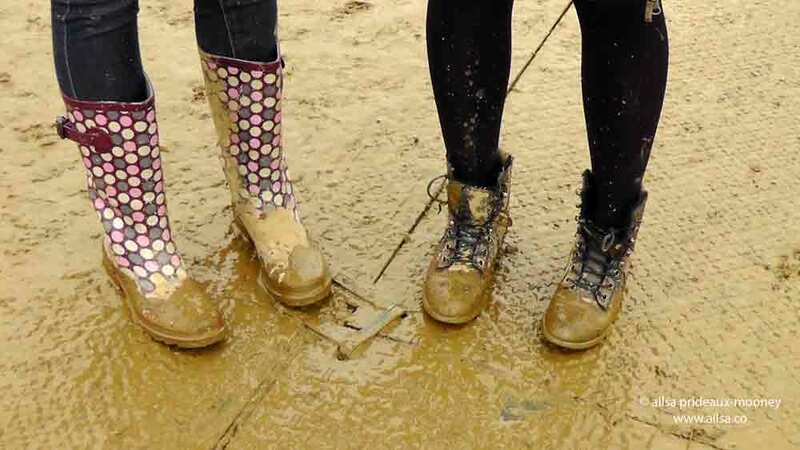 As my flimsy porous sneakers sank into the quagmire and silt found its way into my socks and squelched between my toes, I eyed other fair-goers’ footwear with envy. 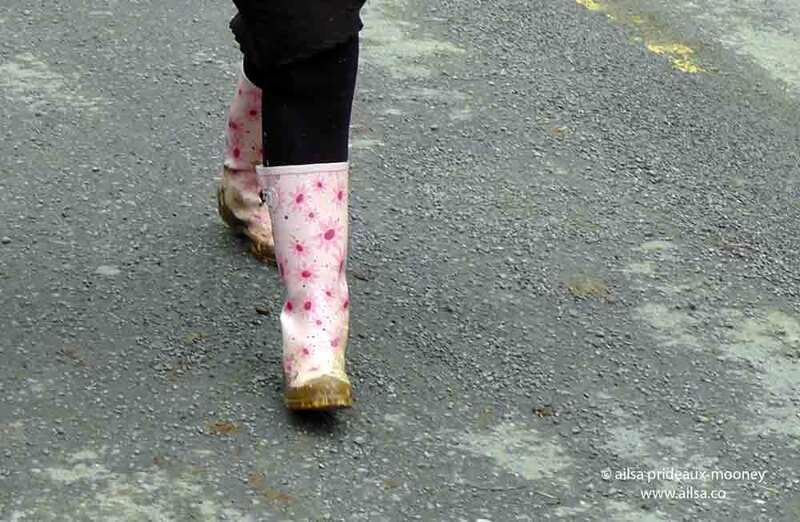 Wiser folks frolicked around carefree in brightly coloured wellingtons; pink was the colour of the day. 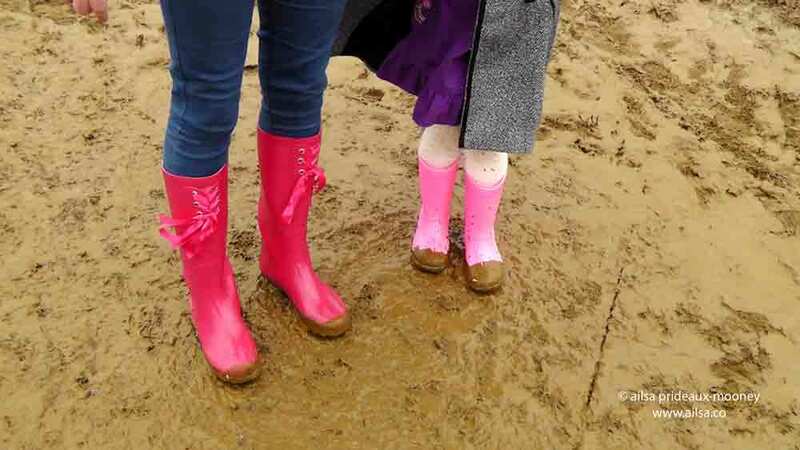 I only noticed a few other visitors with poorly chosen footwear – they were easy to spot, teetering around trying not to slip, leaping hopefully towards the occasional patch of mud-free grass only to fall a few inches short and sink ankle deep into the mud. I decided there was no point in trying to avoid the mud and it seems I was not alone. 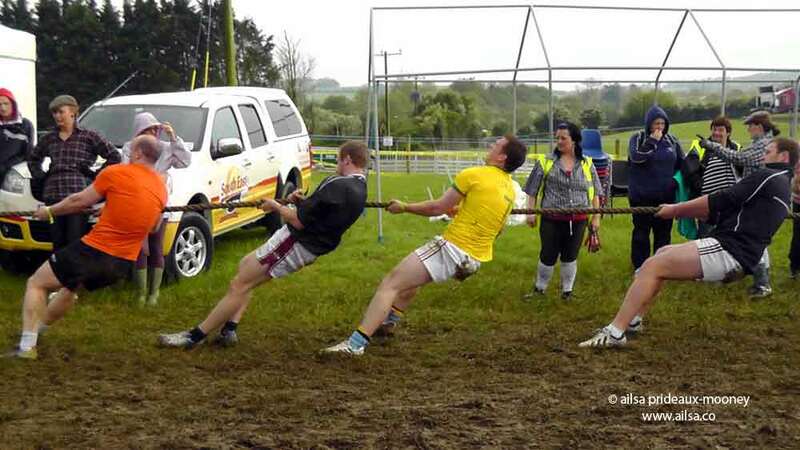 Nearby a group of hearty fellows took advantage of the ooze to liven up a tug of war. Both sides were caked in mud by the end of the game. But now the main event was getting ready to kick off, so everyone traipsed towards a giant blue and yellow striped big top, labelled Sheep Shearing Dome. Inside, a lone singer got the crowd going with rousing renditions of Viva Las Vegas and Folsom Prison Blues. Then the stage filled with judges and adjudicators and a big cheer rose from the crowd as the junior contenders took the stage. 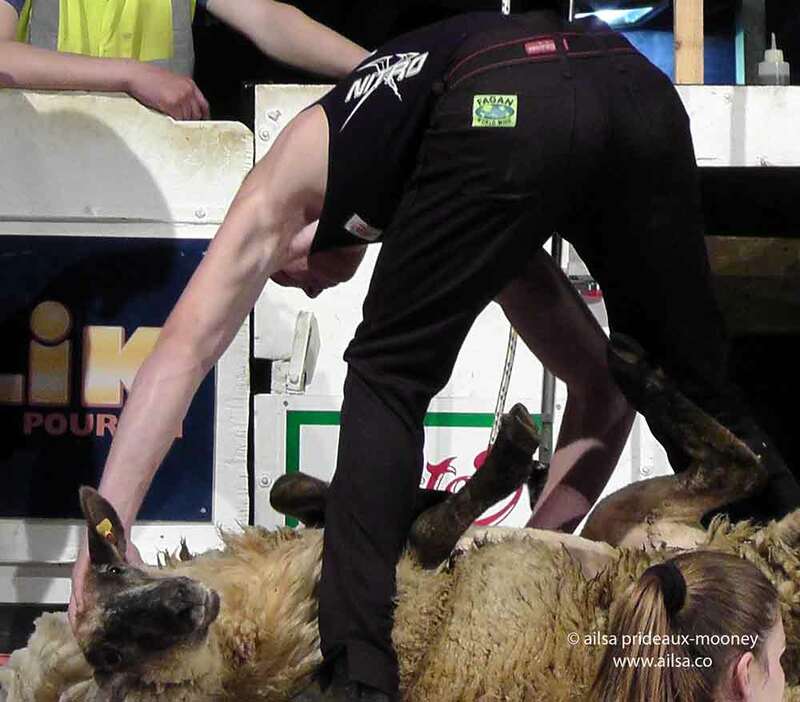 A line of girls crouched down by the stage ready to grab the wool as it was sheared and then they were off. Five sheep each, with points given for speed and technique. Each sheep had to be fully shorn, with the wool coming off as a complete coat. The sheep for the most part looked relaxed if perhaps slightly embarrassed as the boys shifted them around removing their curly coats. There was a moment of excitement when one of the sheep decided it wasn’t going to give up its coat quietly, kicking one of the Welsh shearers and making a run for freedom, but with a little gentle coaxing he re-assumed his position and left his coat behind. In a whirl of flying wool it was all over in a few minutes; the points tallied and the winner crowned. Another row of shearers took the stage with five more sheep each lined up for shearing. 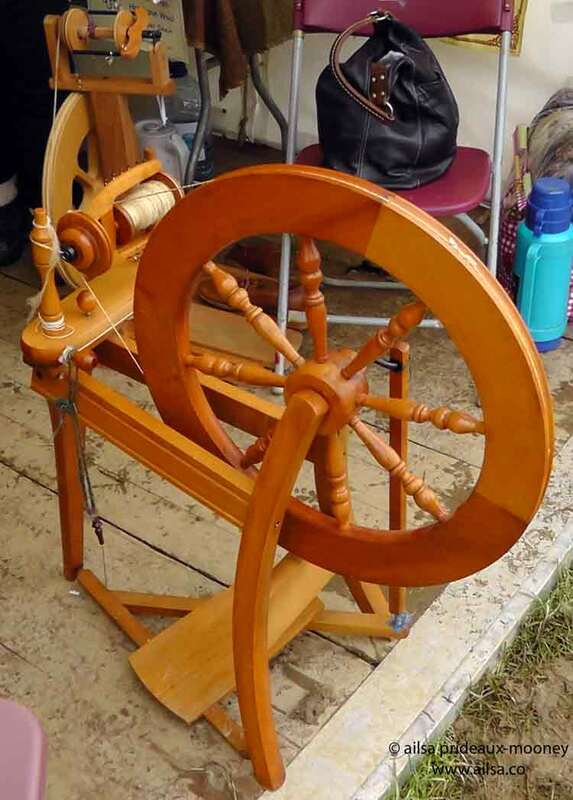 As the crowds cheered the shearers on, I wandered outside where the glorious Irish weather decided to add to the muddiness by pouring liquid sunshine down (for the uninitiated, liquid sunshine is an Irish ewe-phemism for torrential rain). 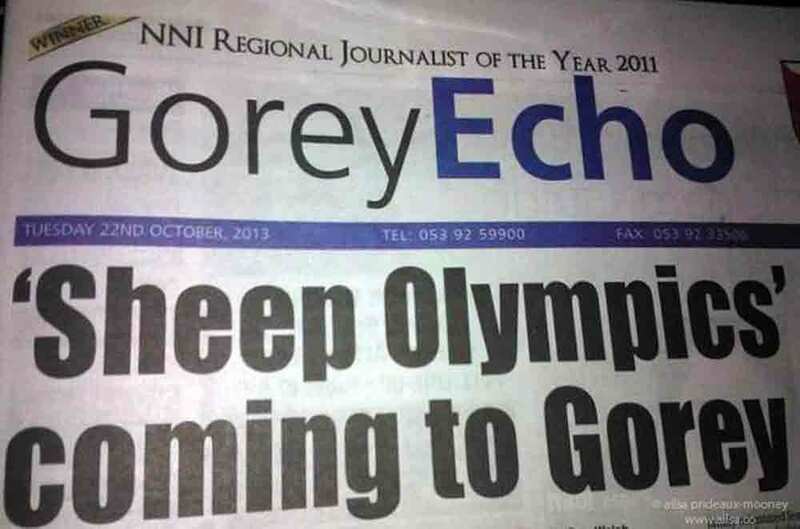 Between you and me, I must admit I secretly wanted more from the Sheep Olympics – I had visions of sheeplechases and synchronized sheep dips, or at the very least a long jump and high jump. 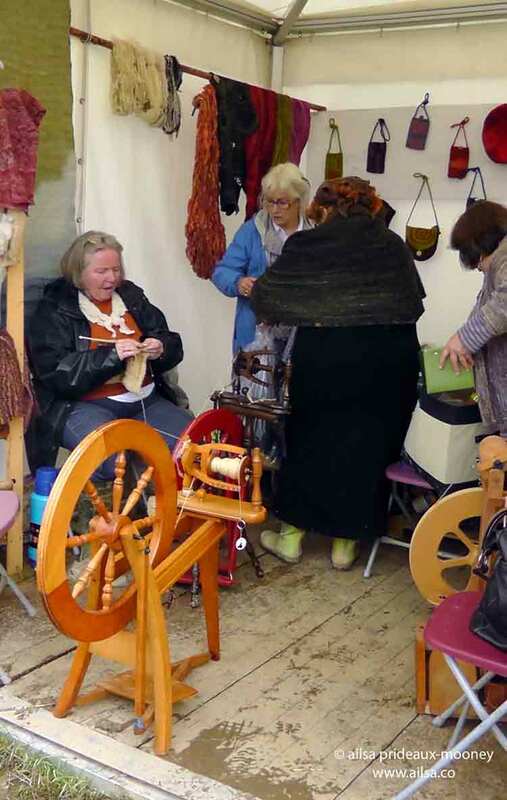 By the side entrance to the main tent, a group of women sat around spinning wheels, spinning wool ‘hot off the sheep’ into yarn and knitting it up in situ. I wonder if the end product was given back to the sheep to wear – it was a pretty cold day to be wandering around without a coat. All in all, it was an unexpectedly fun day out, but, like all true Olympics, it was not without a few disturbances. 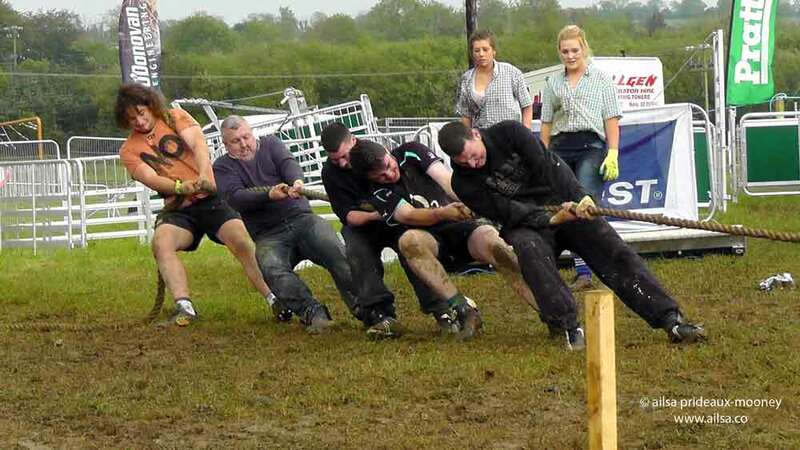 On my way home, I spotted a field of soggy cows who had controversially chosen to boycott the Sheep Olympics, on the grounds it was too sheep-centric. Maybe a more inclusive Farmyard Animal Olympics should be considered for next year. 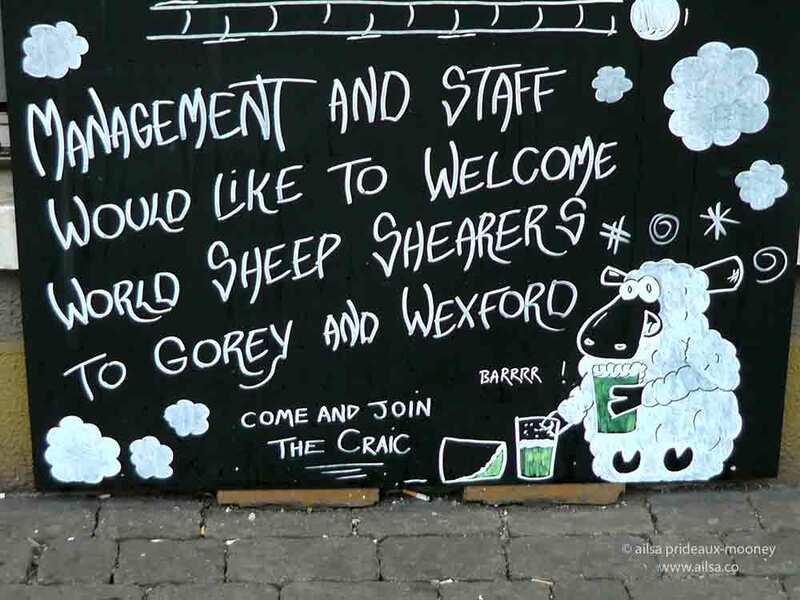 This entry was posted in Europe, Ireland, Photography, Travel and tagged humor, ireland, photography, photos, pictures, travel, writing. Bookmark the permalink. Great post. It looks like a lot of fun. Brilliant post. I think I might have to add this to my Bucket List. Only in Ireland! 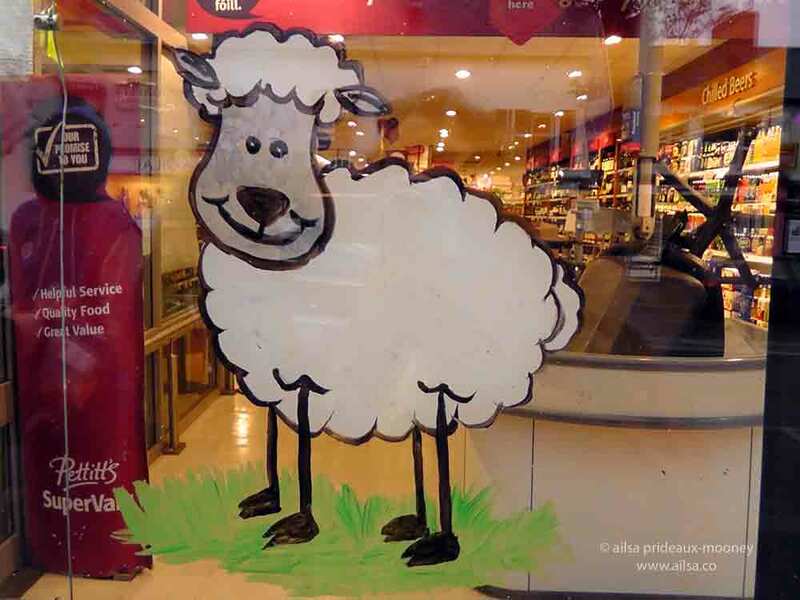 I love the inventiveness of the sheep displays in the shop fronts- almost outdid the actual event. 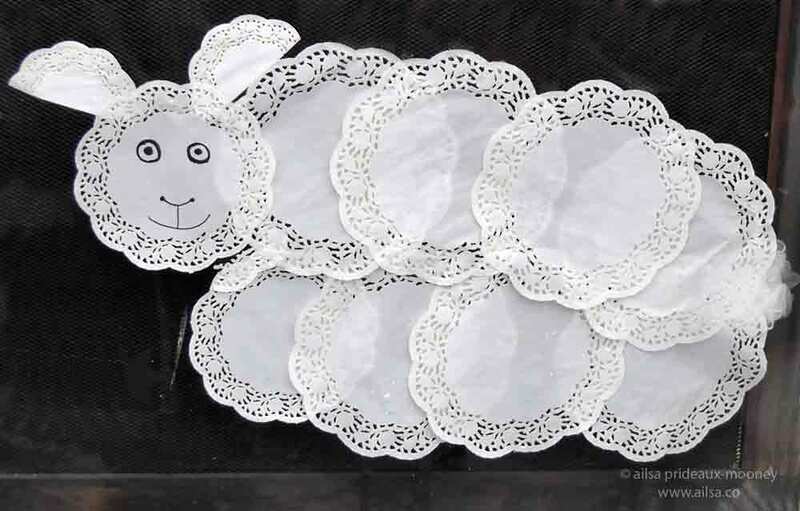 Agreed, Francesca, the whole town was a frenzy of sheep, I had a blast. I love your posts, Ailsa – so glad Jonell introduced us! This was my favorite yet. Makes me want to book a flight to Ireland! 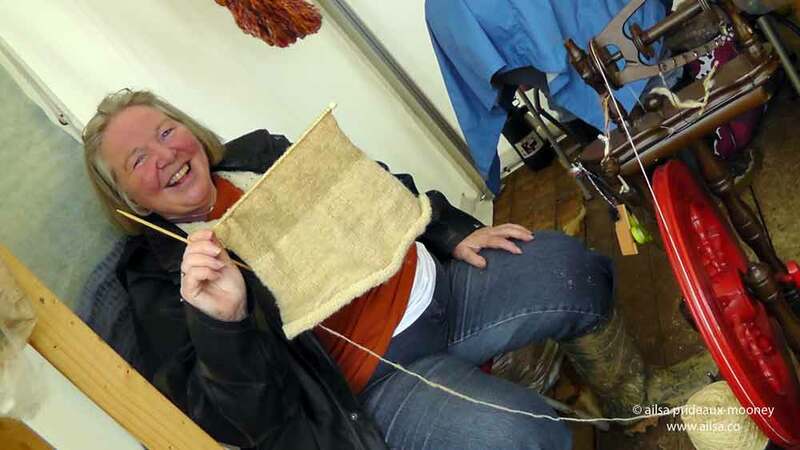 Shearing is such a skillful task, i love to watch! looks like you had a fun day. 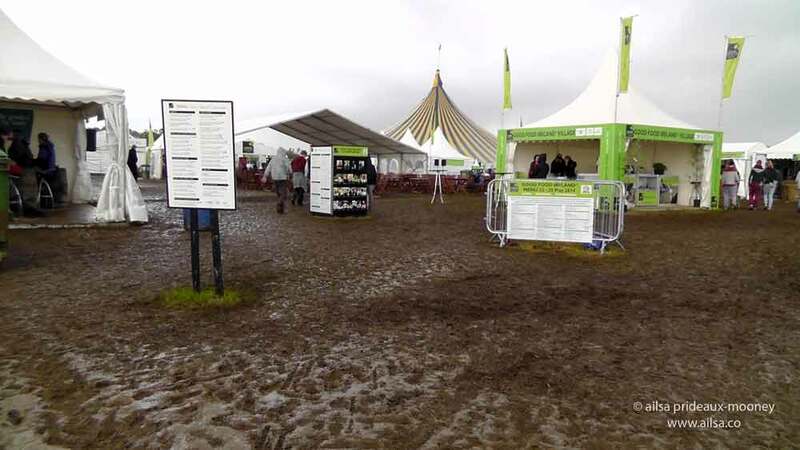 The last day of our local Devon County Show was cancelled yesterday because the mud was so bad it was a safety risk. Those guys made it look easy, Gilly, they just whizzed through the sheep in a matter of minutes. Sorry to hear it’s just as muddy round your way. Stay dry! 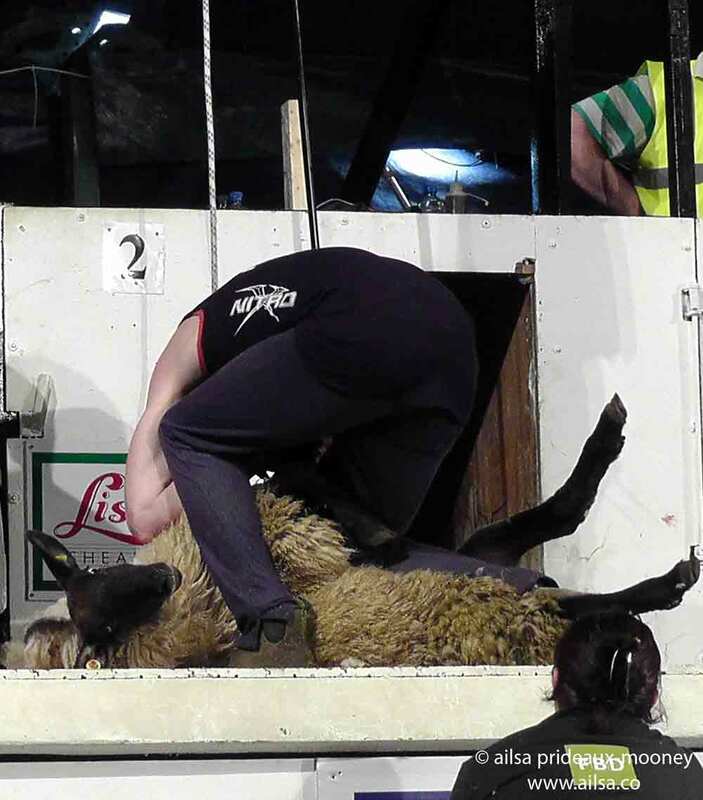 I watched some sheep shearing when I was in Australia and it really is a bit of a dance with the reluctant sheep! What an amusing and varied post! You noticed so much and recorded everything in amazing photos and punny words. Thanks for a morning delight. what a wonderful, fun-filled post. You must have had as much fun writing it as you did on the actual day. Definitely seems like a lot fun. 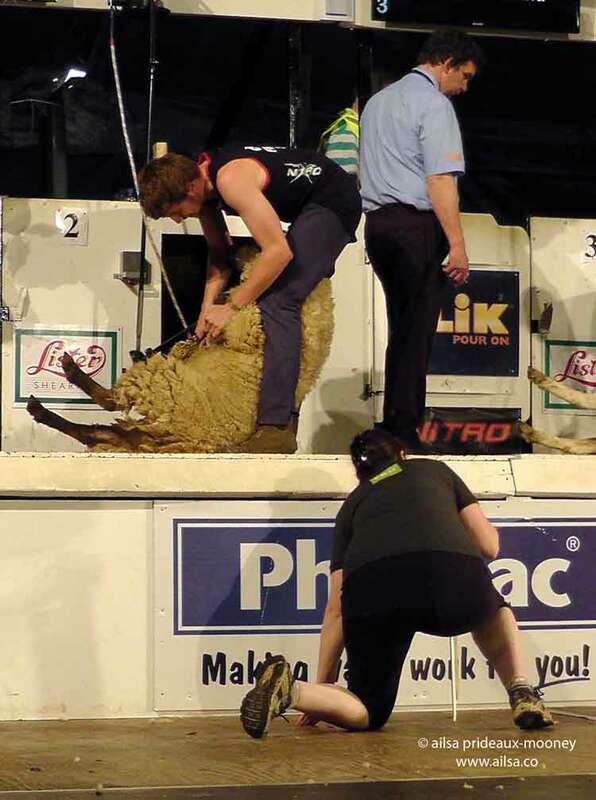 I’m in the middle of re-reading Thornbirds which has lengthy descriptions of sheep shearing in Australia – your images are most timely! 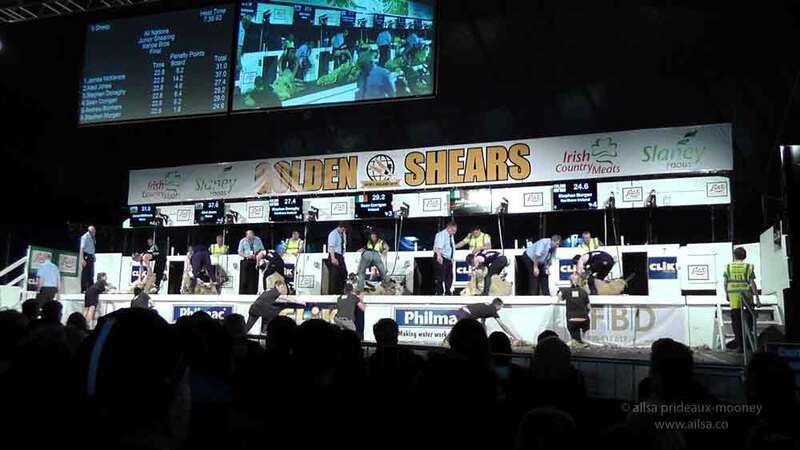 Enjoyed your post from Ireland’s Golden Shears. 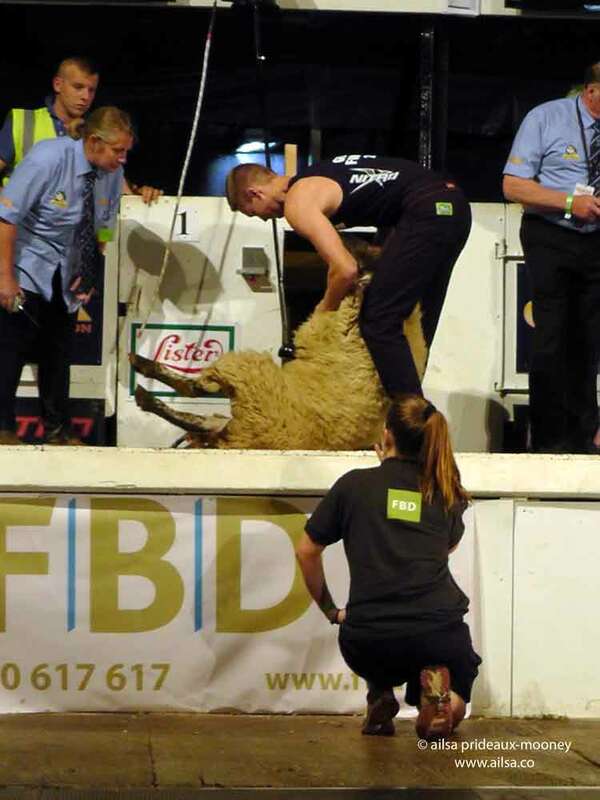 Were there any Australian or new Zealand shearers competing? I have heard of the Golden Shears in Victoria or New Zealand, so quite surprised to see another Golden Shears. 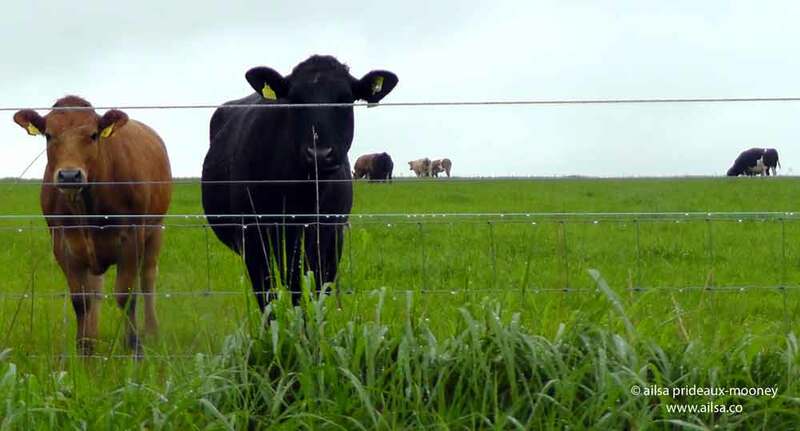 Yes, there were lots of Australians and New Zealanders there, actually folks from all over the world – it was the global finals – I think they hold it in a different venue each year, and this year it was Ireland’s turn. Great post. Love the photo you selected for the header. I was quite envious of those boots, Judy, I can tell you! Haha that looks brilliant! I love how much everyone gets in the spirit! Hilarious Naomi…really enjoyed your post. Isn’t this a stitch? I laugh every time I see it! What an entertaining post. 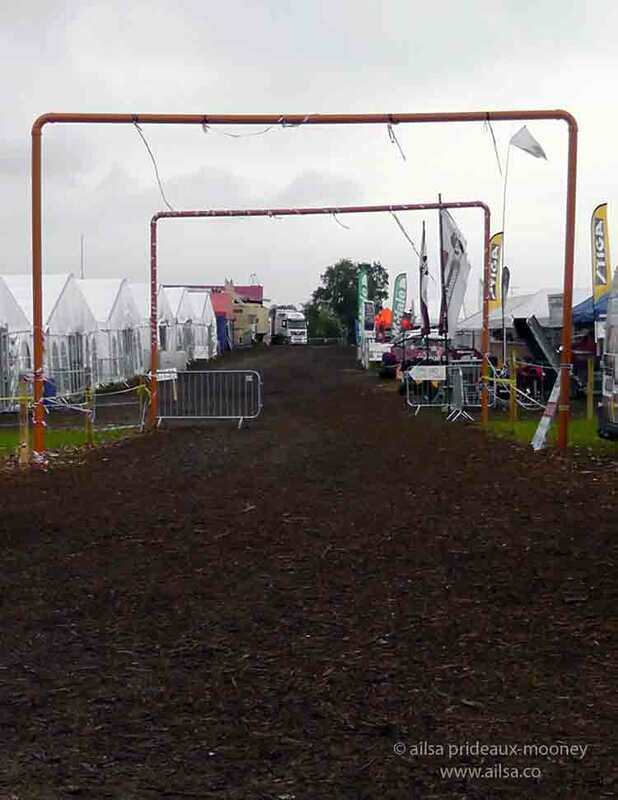 I’d have loved this, mud and all. I’ll remember my boots. How fun! I love it when the whole town gets involved in the spirit of something like this. We have a Flying Pig Marathon here in Cincinnati and there are all sorts of flying pig memorablia and silly themed events and merchandise that weekend, too. 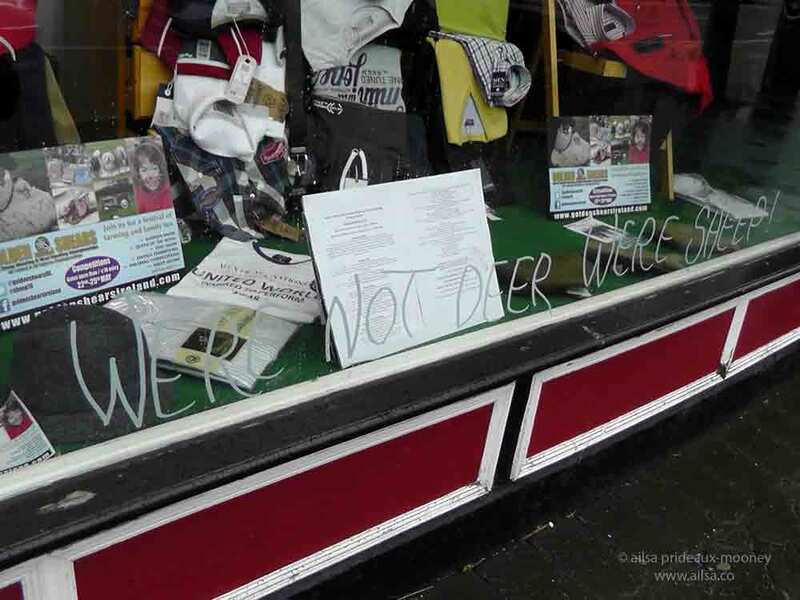 Love business owners with a sense of humor. Even more, I love a blogger who makes fun of businesses. 🙂 Another in a string of great posts! Omg I laughed so much, this post is so much fun! 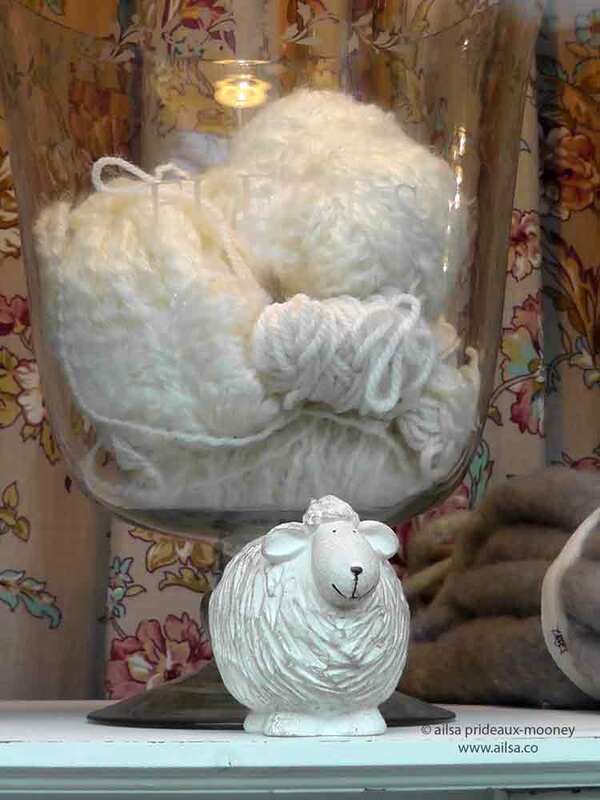 The photos of the storefront windows were great, the mud was unbelievable, and the sheep olympics definitely belongs on my bucket list! Thanks so much for sharing this!